As we turn the page and enter 2019, it’s a time of new beginnings, new adventures, new friendships, and when we get down to the nitty gritty, new property assessments and new tax rates too. On the latter note, the chart to the right provides a recap of the 2019 - and 2018 - tax rates in 22 towns/cities in Weston, Wellesley, Wayland and the surrounding area. Of the 22 towns and cities, Sherborn, at $19.62 per thousand, has the highest tax rate, which has been the case since 2013. And Brookline, at $9.37 per thousand, has the lowest tax rate, which has been the case since 2014. (Needham had the lowest tax rate in 2013.) 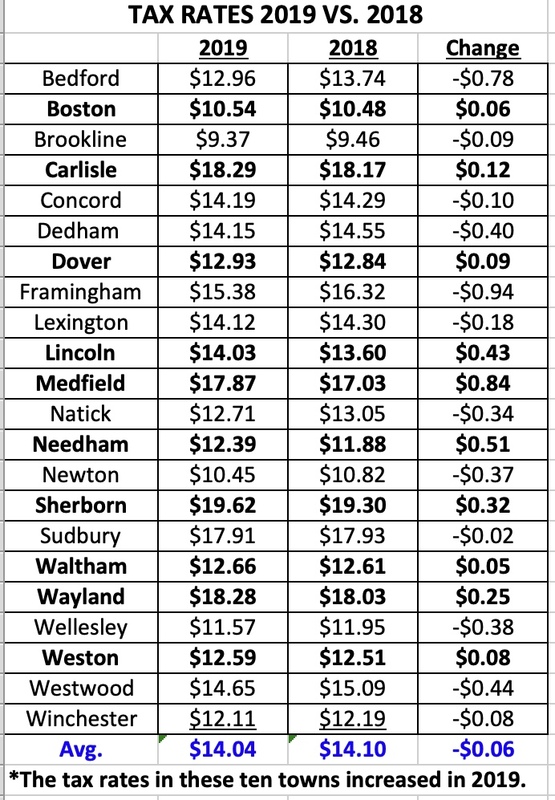 The biggest increase this year was in Medfield which was up $0.84, and the biggest decrease was in Framingham which was down $0.94. So what does this all mean for you? Well honestly, not that much…. If you are buying a home, the tax rate is not usually a determining factor in which town you choose to live. Perhaps it might come into play if you are on the fence between two towns, and there is a striking difference in the tax rates. But even then, likely not. And on the same note, if you are selling your home, the tax rate is probably not one of the compelling reasons that you’re doing so. After all, you bought your house knowing the town’s tax rate. That being said, if the tax rate increased alarmingly over the years, that’s a different story. But as you can see, the increases and decreases don’t change much from year to year. The average change this year from last was just a slight decrease of $0.06. What are your thoughts on this subject? Did the tax rate of your town influence your decision when you were buying or selling your home? Did it play a role at all? I can’t wait to hear….